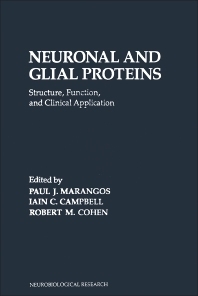 Neuronal and Glial Proteins: Structure, Function, and Clinical Application focuses on the basic and clinical information relating to a number of proteins that are either enriched in or unique to nervous tissue. This book discusses the structural and functional characteristics of cell-specific proteins, which provide a better understanding of the molecular mechanisms involved in processes that are specific to glia or neurons. Organized into three sections encompassing 15 chapters, this book starts with an overview of the fundamental principles and strategies involved in studying the anatomical, structural, functional, and immunological aspects of brain protein. This text then discusses the techniques, including the preparation of brain tissues as well as the preparation of neural and glial cells in purified form. Other chapters review the two-dimensional gel electrophoresis, which is recognized as a significant technique for discovering brain molecules. The final chapter deals with the membrane-associated nervous system proteins. Neurochemists and clinical researchers will find this book useful.